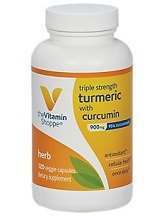 What is The Vitamin Shoppe Triple Strength Turmeric with Curcumin? The product, Triple Strength Turmeric with Curcumin, as the name suggests, contains turmeric which has a wide array of benefits. It is a powerful antioxidant which means it helps to prevent damage by free radicals to cells, thereby inhibiting signs of aging and promoting better skin health. It also has anti-inflammatory properties. To add to the list of its benefits, it further helps to promote better digestion, thereby contributing to effective weight loss and weight management. Turmeric, along with curcumin, has also proved to be effective in the treatment of depression and the improvement of mood swings. The main ingredients present in the product are 900mg of turmeric extract standardized to contain 95% curcumin. It also contains 5mg of Bioperine. Other ingredients present are silica, magnesium stearate, and vegetable cellulose. This product is corn free, dairy-free, fish-free, gluten-free, salt-free, soy-free, starch-free, sugar-free, wheat-free, yeast-free, nut-free and citrus-free. This is an all-natural health product that is free from fillers and binders. This product does not contain animal derivatives, preservatives, artificial colors or flavors. Triple Strength Turmeric with Curcumin comes in the form of capsules. It is advised to take one capsule a day. It is recommended to consume this veggie capsule preferably with a meal. One bottle of the product contains 120 vegetarian capsules and can be purchased for $49.99 from the manufacturer’s website. The value per serving totals to $0.41. No information on any discounts is available if the customers prefer to go for bulk purchases. No possible side effects of the Triple Strength Turmeric with Curcumin product is mentioned on the manufacturer’s site. However, after reviewing the user’s testimonials, it is found that few customers have experienced difficulty in swallowing the veggie capsule and few have experienced stomach aches after consuming the product. The manufacturer offers a 30-day money-back guarantee. However, only bottles that are returned unused will be eligible for a refund. The product Triple Strength Turmeric with Curcumin is a natural one and it is free of any harmful additives. The product is free from most of the major allergens and it is also suitable for vegetarians. The product’s usage instructions are simple to understand and easy to follow. Furthermore, the product is priced low for three months of supply, making it quite a suitable deal for customers in any price-range. However, the manufacturer has not specified the time period for which this product should be consumed to see the desired results. Given such constraints, the customers might want to look out for other options on the market.